"Photograph of Henry L. Foss's Mother and Siblings"
Photograph of Henry L. Foss's mother and siblings taken at his sister's (Mertie Foss Rich) Camp in East Madison. Names provided by family. 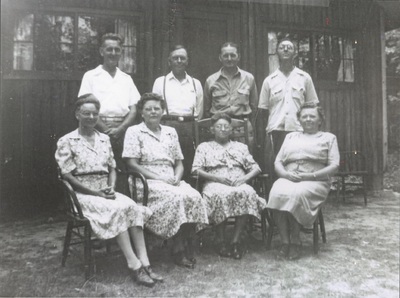 Back Row: Edwood, Henry, Leander, Woodrow; Front Row: Leora, Mertie, Elsie (Mother), and Lilla.